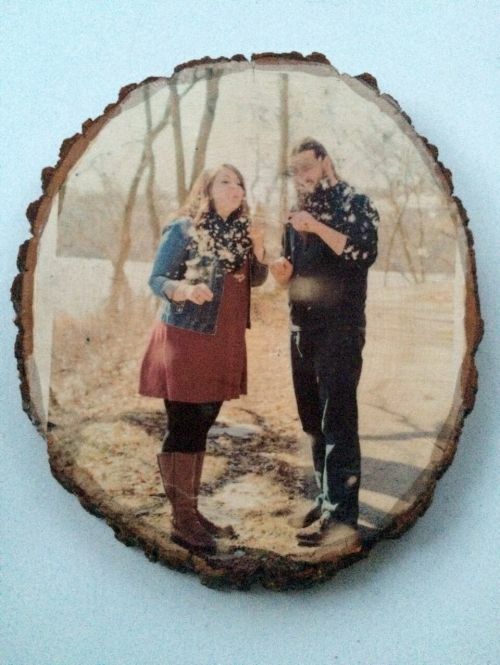 Get your photos off Instagram and into real life by adding them to a fancy wood slice below! 1. Follow the instructions on the printable tattoo paper and use an inkjet printer to print your photo of choice. Follow the paper's instructions again to apply the clear adhesive sheet that comes with it to make it a "tattoo." 2. Trim the paper down to be the shape of your wood slice. 3. Peel off clear adhesive transfer sheet from your photo and place photo face down onto your wood slice. 4. Apply water just like you would with a temporary tattoo on the back of the photo. 5. Carefully peel off the paper, leaving the photo on the wood slice. Apply more water if it doesn't stay on the slice. 6. You win! Let dry.